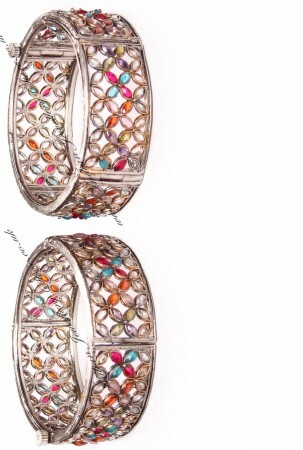 PAIR Indian bangles in antique silver & vibrant multi-coloured. Set with polki stones. Size: 2.6, i.e 2 & 6/16 inches inner diamerer (medium) - although there is a screw fastening so will fit other sizes. Bangle thickness (aprox max): 2.2cm. Indian Jewellery Store LOVES this product because it is in line with styles worn on the bolywood red carpet. These bangles ar very versitle and cross ages well also. 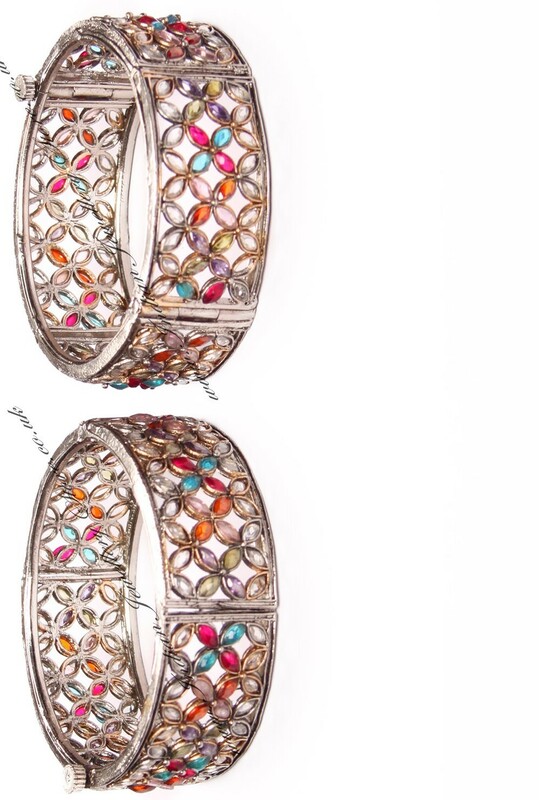 Indian jewellery top TIP - wear these bangles on the outer edges with just plain metal bangles inside in 1 or more blosk of colour foro the latest mumbai catwalk/fashion look! Also can be worn as singles for a clean / wern look.